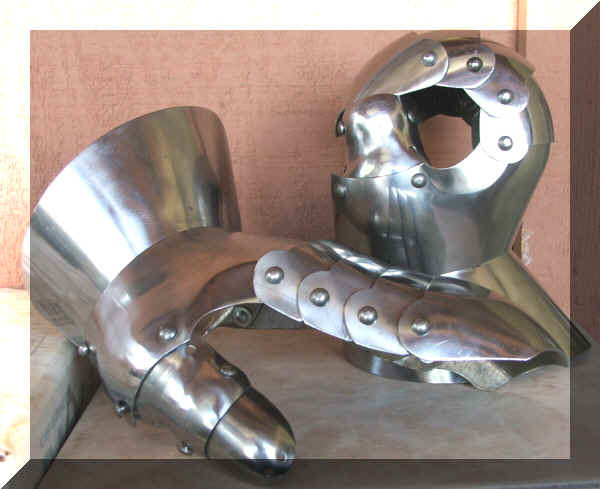 Articulated Gauntlets, Mild Steel [G-05] - $375.00 : Windrose Armoury, We Bring History To Life! Developed in conjunction with Greg Anderson of Mandrake Armory, these will hold up to the rigors of SCA combat but not break the bank. 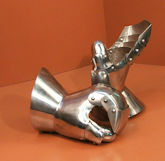 These gauntlets feature a widely flared cuff, slotted articulation for the thumb root plate, and a modified version of Greg's fabulous clamshell finger design. Tumbled finish. The only size available at this time is medium, which should fit most hands with light padding. Will easily accomodate hands that measure 4 inches across palm, and finger length of 4 1/2 inches. Smaller hands may fit with smaller gloves.